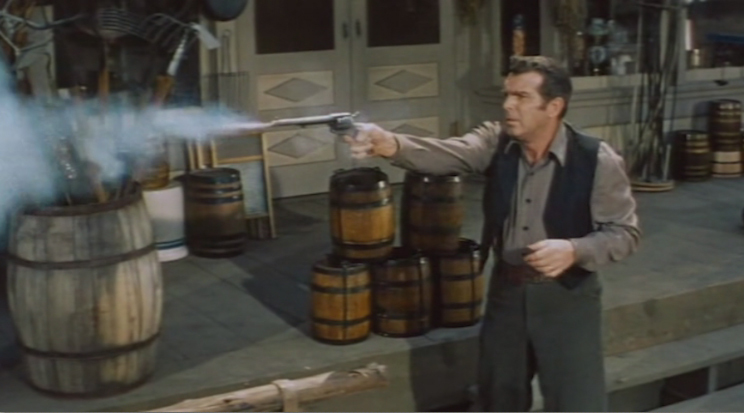 Jack Wright (Fred MacMurray) is the peace-loving owner of a general store in the quiet town of Plainview, Texas. In fact, Plainview is so docile that the town marshal hasn't fired his weapon in 5 years. This all changes when the Dennis gang decide to rob the town bank, and wind up killing the marshal in the process. 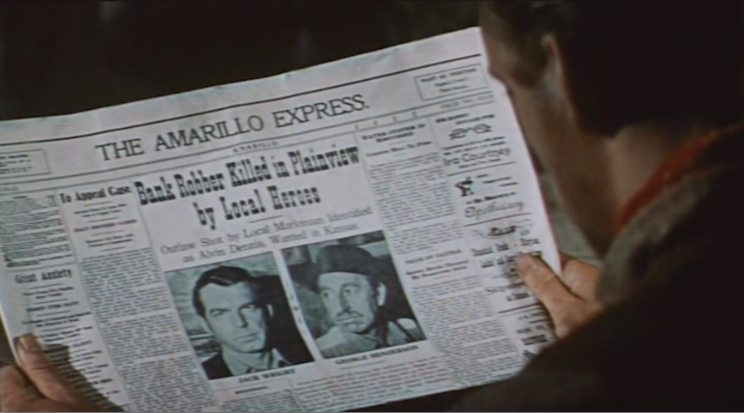 Jack, who has no idea how to shoot or handle firearms, accidentally becomes the town hero when he picks up the marshal's gun and hits a one-in-a-million lucky shot that puts the leader of the gang out of commision. Jack knows that it was just dumb luck and tries to explain this to his fellow citizens, but they insist that he is a legendary crack shot and even try to make him the new town marshal. 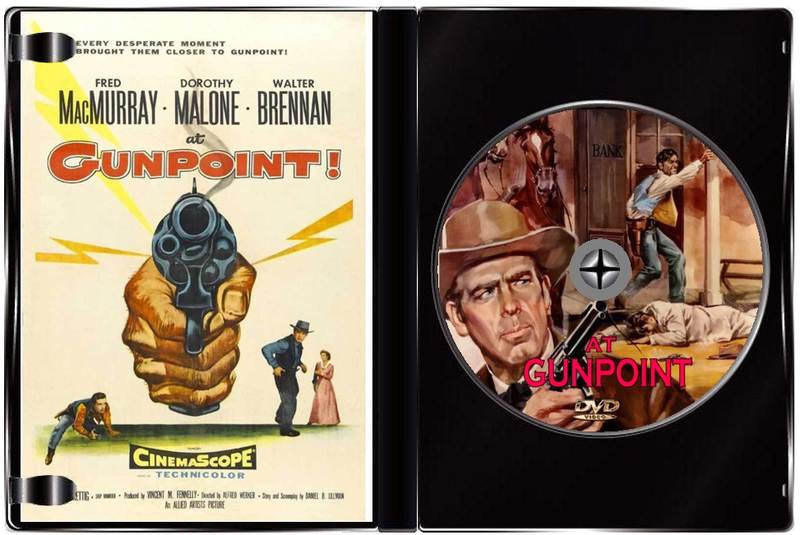 Although he's the toast of the town at first, things change in a hurry when it becomes clear the vengeful bandit's brother (Skip Homeier) seeks revenge and will kill anyone who gets in the way! This causes Jack's cowardly neighbors and friends to abandon him and they even try to kick him out of town. 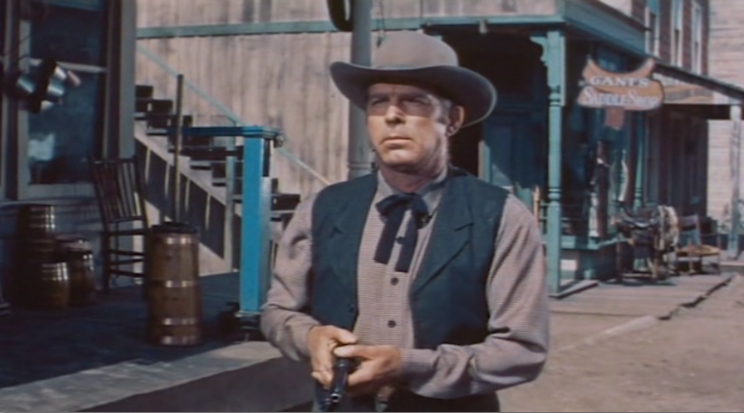 Wright, who can barely load a gun much less hit the broad side of a barn, is now left to stand alone against Homeier and his gang of deadly, angry killers! 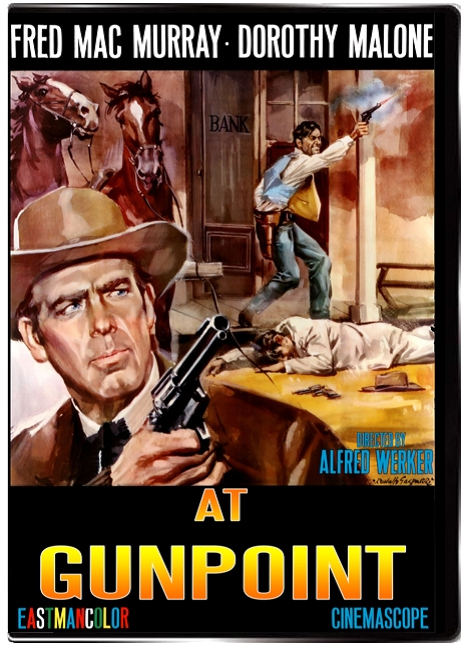 At Gunpoint is directed by Alfred L. Werker and is written by prolific Western story teller Daniel B. Ullman. It's a Technicolor/CinemaScope production with Ellsworth Fredericks on photography duties, and the wonderfully-named Carmen Dragon providing a bracing score. Supporting MacMurray and Homeier are Dorothy Malone as Jack's increasingly fretful wife, and Walter Brennan as the testy old town doctor. Brennan is particularly good in this film. When his best friend and chess-partner is killed, Brennan wonderfully underplays the scene where he sees that his friend is dead. He gives only the slightest view of his anguish but you can tell he's completely devastated. Whit Bissell is also here as a welcome secondary character addition. High-quality acting and a moody atmosphere constructed by Werker make this film a memorable morality play. MacMurray, the honest and reluctant hero, perfectly plays it restrained which makes his plight heartfelt and believable. Homeier was always best when playing a snarly villain and here he delivers just that: a scumbag hell-bent on revenge whose actions speak louder than words. Werker was an old pro who was coming to the end of a career that spanned 32 years. He offers up some nice tonal delights such as a dusty storm that descends upon Plainview - it coincides with the town residents having a distinct change of attitude. 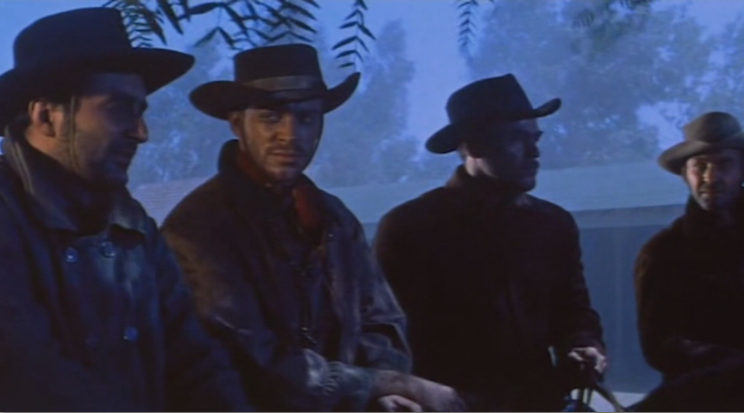 Then there's his framing of the Dennis gang as they come for revenge; it's impossible not to think of them as the four horsemen of the apocalypse. The final shoot out, and the twist in the horse's tail, is awash with tension and crowned by a remarkable bit of stunt work. This a very fine, underappreciated film that will hopefully find more fans as the years roll by.